One of the world’s greatest amplifier manufacturers has just released a new range of amps. 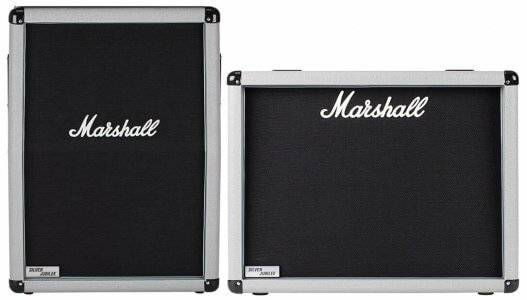 Announced at this year’s NAMM 2019 convention, Marshall gave us the lowdown on their upgraded cabs, heads and combos from their Studio Classic, Vintage and Jubilee Series. So, let’s have a quick look. Inspired by one of the most successful guitar amps in Marshall’s history, the JCM800 2203, the Studio Classic Valve Amp Head provides the full range of JCM800 2203 tones. From rich and fat cleans to heavier driven aggressive sounds, both head and combo are powered by a set of ECC83 and EL34 valves. Each feature a single channel with high and low sensitivity inputs. Plus, its control panel comes complete with master volume and versatile EQ settings. These include presence control and a preamp volume control. So, there’s plenty of room to find the sound that suits your style. When it comes to the cabs we’re spoilt for specs, too. Both the 1×12 and 2×12 are very powerful, yet extremely lightweight. They feature modern, 12″ Celestion V-type speakers that emit classic vibes with clean mid-range tones and a crispy top end. Overall, the unique blend of note definition and vintage character make them perfect for high-speed players. Next, we have the Studio Vintage valve amp. Based on the famous 1959SLP, an amp that inspired generations of iconic guitarists, this updated model also provides those same indisputable tone shapings. It performs anything from overdriven blues tones to crunching leads for classic rock. And, the amps provide four separate inputs for you to blend your sound. Plus, a control panel with effective EQ settings and enough versatility to change your style in an instant. Once again Marshall, really spoil us. With a set of 12″ Celestion V-type speakers, the amp kicks out lots of tightly controlled low-end and glossy high frequencies. These speakers deliver extraordinary note definition whilst being wrapped up in a glorious, vintage style. Equally, their timeless look means you can shove it in any practice room and enjoy a classic looking amp with the benefit of modern upgrades. Finally, we have the Silver Jubilee cabs. Way back in 1987, Marshall celebrated 25 years in business and built the JCM25/50. Now, 32 years after the celebration began, Marshall has delivered an upgraded version. Featuring 2 Celestion G12 Vintage speakers, these cabs deliver punchy lows, smooth mids, and creamy highs. And, if you have one, they’re designed to perfectly suit your 2525 mini silver Jubilee amp heads. So, that’s all folks. For now at least, anyway. Get in touch with the guys here at Rich Tone and we’ll make your dreams comes true. But, if we can’t then at least we have these Marshall amps for you instead.